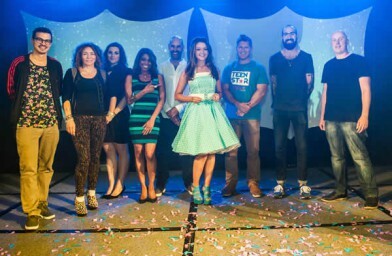 The national singing competition TeenStar has found its latest winner! Joining a long line of prestigious Future Music competition winners, Emily Middlemas from Glasgow, Scotland has been crowned as TeenStar 2014 champion at The NEC in Birmingham. Emily Middlemas was crowned champion in front of a capacity crowd and a prestigious music industry judging panel at The NEC in Birmingham on Saturday night. Singing her own original song “Goodnight Kiss,” Emily won over the competition industry judges making her the winner of the Mid-Teen age category and the overall winner of the TeenStar singing competition. She has now won a recording and development deal including £5,000 to spend on the development of her music. The national singing competition is brought to you by Future Music – the company behind the discovery of artists such as Jacob Banks, Warner Music’s Birdy, Columbia Record’s Lucy Spraggan, Union J’s Jaymi Hensley and Jahmene Douglas, both of which are now signed to Sony Music, and last year’s TeenStar competition winner Luke Friend, who was runner up on The X Factor last year. After impressing the judging panel at the auditions Emily Middlemas battled against more than 9,000 acts who signed up to TeenStar this year across the UK. She went on to perform in the TeenStar live showcases, battling through both Regional and Area Final heats to make it to the national Grand Final. The judging panel for the Grand Final included record label representatives from Sony and Universal, as well as names such as four time Ivor Novello award winner Mark Hill, Birdy’s producer Gareth Henderson, Sony Music talent scout James Dillamore, A&R scout for Universal Music James Meadows, Jayne Collins – an A&R consultant for major record companies who has put together and managed The Saturdays and The Wanted, CeCe Sammy – a TV personality and celebrity vocal coach who has worked with the likes of Diana Ross, Will Young, Simon Cowell and Leona Lewis, journalist for TeenStar partner Shout Magazine Claire McDonald, along with Head of Future Music Chris Grayston. Also picked by the judging panel as winners were Jake Mckechnie from Wigan, Manchester, who won the Pre-Teen age category, and Victoria Bass from Folkestone, Kent who took home the title for the Late-Teen age category. Emily has now won a comprehensive consultation package with Future Music, an extensive winner’s publicity package, and an amazing £5,000 to spend on the development of her music. On winning the prizes Emily said,”Thank you to the TeenStar team for being so supportive throughout my musical journey, as well as my mum and dad, and the industry judges”. Check out the music industry judges’ top scores by clicking here. For more information on what the music industry judges thought about Emily Middlemas’ performance, check out their feedback here and watch her winning performance here. Future Music is also about to start auditions for Open Mic UK. It’s not too late to enter and audition in the next few coming weeks. To find out more and enter Open Mic UK now go to www.openmicukco.uk.